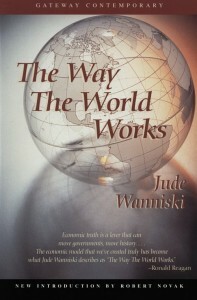 On August 30, 2005, the world lost a great mind, that of Jude Wanniski. “The political model holds that the electorate is wiser than any of its component parts. Barack Obama, as he continues to provoke and escalate what could virtually be called a cold Civil War, ignores Wanniski’s sage observations to his steady demise. Rather than stepping back and acknowledging that Scott Brown’s recent win in Massachusetts’ special election for the late Ted Kennedy’s senate seat is but the latest attempt of the voters to say “No!” to his overreaching agenda, he instead doubles down and promises an even stronger fight. When Wanniski talks of emigration, it is easy to think of places like Mexico, from which thousands of citizens try to flee each month. But it should be just as easy to think of California, or New York, or Michigan, all laboratories of big government and all reaping the failures of the policies they have sown. To now have the voters of Massachusetts emigrate en masse from their tradition of sending a Democrat to the Senate, a seat held by over fifty years by a Kennedy, is nothing short of cataclysmic from a Democratic pollster’s vantage point. The volume of this message to Obama should cause more hearing damage than Spinal Tap’s amps cranked up to eleven. As for Wanniski’s talk of revolution, one only needs to look to the followers of Ron Paul and the morphing of that into the Tea Party movement. Now referred to as “astro-turf” at the peril of the accuser’s reputation, after shocking swings of the voting pendulum in Virginia, New Jersey, Westchester County New York and now Massachusetts, it should be clear that this is one Party that is going to give a wicked hangover to resolute defenders of Big Government. Come November, we’ll learn whether or not Congress has swung far enough to override a Presidential veto on a Wanniski-style supply-side tax cut. Simply allowing the Bush supply-side tax cuts to become permanent, rather than expire at year’s end, would substitute nicely. In the meantime, Obama would do well to head Wanniski’s even larger message: that no matter how smart of an administrative team he tries to assemble and maintain, it is no match for the collective wisdom of the electorate. If he realized the latter, he would drop his populist class-warfare and instead pursue an agenda of individual empowerment, rooted in personal liberty. Doing so might be his only hope for winning a second term, possibly against Scott Brown. did you creat this all by yourself? I think Greenspan is getting senile, today he said that you can stop asset bubbles by increasing capital requirements. That just increases the cost of credit. The next time you have a real estate bubble, you’ll have the same problem, assuming that banks are still in the business of loaning against real estate. If you want to stop this problem, then eliminate the federal subsidies for real estate development and investment, then require people in that industry to put their own money at risk instead of someone elses. If Greenspan really wants to change the banking system, though, then simply ban 95% and 90% LTV loans. Require a bigger equity cushion. BTW, the “too big to fail” argument is a fallacious one. During the Great Depression, Canada had no bank failures. The reason was that their banks were very large. The banks closed branches, etc., but none of them failed. By contrast, the US was dominated by thousands of very small banks, and we had more than 10,000 of them fail. So there is nothing inherently unsafe about a banking system dominated by large banks. The real problem with large banks is that during good times, they don’t provide enough competition for each other. Amazing piece of writing! This will guide a lot of people learn more about this particular issue. Do you want to include video tutorials along with these? It could certainly help out. Your conclusion was spot on and owing to you; I will not have to explain everything to my pals. I can just point them in this article! It is remarkable, it is very valuable information! Thank you for killing my boredom. I am currently at work lol. Good Read.